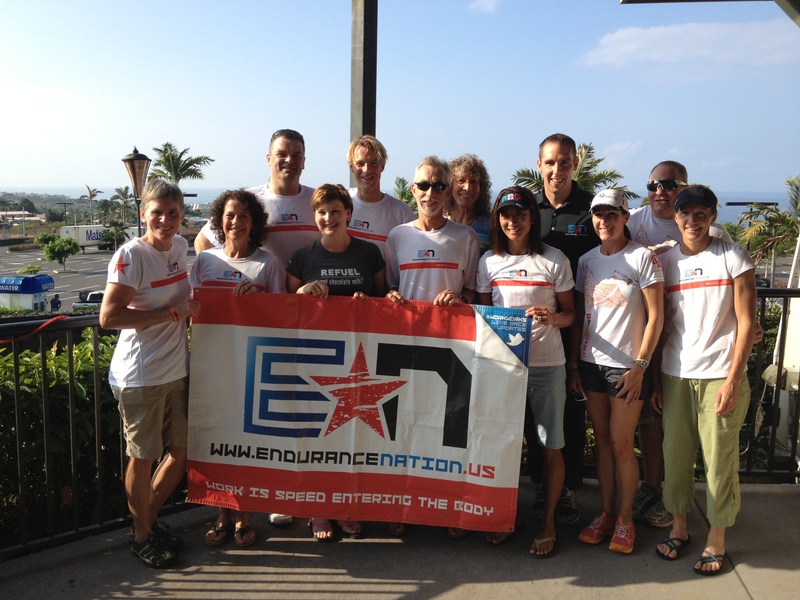 Every year Team Endurance Nation puts ten to twenty athletes on the biggest triathlon stage on the planet — the world championships of Ironman® Hawaii. Over the years we have learned a great deal about the preparation for this season-ending, life-altering race, and we want to share some of the highlights as well as what we consider to be our most critical piece of advice. Getting to the big show is a big deal…only 1800 athletes a year do it…over the last 30+ years that means that less than 45,000 folks have ever competed in the big dance. Considering more than 250,000 compete in Ironman® events each year, that’s a big deal. But you don’t care about that right now. The only thing you care about it having a great race. And you deserve to…but it’s going to take a lot more than fitness, good fortune and the benevolent support of Madame Pele to make your day. Right now as the race looms, it’s very tempting to try and cram in some final training. But that is the last thing you should be doing, especially if you qualified this year. Odds are you have a ton of cumulative fatigue, and the island will find those small cracks in the awesomeness that is you and tear you to pieces on the big day. Instead of adding more volume, focus your intensity. Most of our athletes have done very well treating the event more like a 70.3® — you’ll need the strength to manage pace changes on race day as well as the conditions. Not to mention that the mental focus required to do that level of training is very similar to what you’ll need on the Big Island. Whether you live north or south of the equator, the race is going to be hard. Even if you are one of the hundreds of competitors who, according to Twitter, have been on Kona since early September to train for the last six weeks of their build, the race will be hard. The only thing that makes Hawaii such a challenge, and worthy of the World Championship label, is the heat. The elevation profile of the bike and run aren’t that significant. The swim isn’t that challenging. The winds are both friend and foe on race day. But the one constant amongst all of these elements is the heat. Even a cool day in Hawaii tends to be in the upper 80s, and with the humidity levels being off the charts, even the most conditioned and fit athletes will suffer. Regardless of whether or not you spent several hours a day over the last month sitting in the sauna at your local YMCA, race day won’t care if you don’t respect what’s happening to your body. Track your heat accumulation by watching your heart rate. You know what your heart rate usually is in the early part of the bike (the free and easy miles) as well as how it shifts upwards over the final 30 to 40 miles. These are numbers you should be able to recite from memory, but if not you’ll have them in your race and training files. Do yourself a massive favor and go back to review those numbers. On the bike you should see very similar numbers, especially at the start when you have a slight tailwind and the temps are “only” in the upper 70s. So look for total synchronicity here. As you move on across the day, you’ll notice the HR creeping up a bit earlier than usual due to the challenging climb up to Hawi. Be patient here as you endure the winds and then recover on the downhill. The real separation will begin on the return trip, where the wind is now a slight head and the climbs are steeper. The steeper the climb, the slower you go. The slower you go, the less the wind cools you off. The less the wind cools you off, the higher the temps get. And since the average temperature is moving up into the mid- to upper-80s, you’ll feel a 10- to 12-degree jump almost instantly…a heat-packed punch in the triathlon solar plexus. Augment the cooling effect of the bike by staying wet, especially when climbing. Ideally you made the super smart choice of wearing some form of cooling sleeves or even “wings” — the ones that cover your arms and shoulders. Because as the bike ride wears on and the temperatures climb, you will need to kick your cooling plan into high gear. I recommend you have three cages on your bike for race day. Two for race hydration as one “active” bottle — typically an aero bottle with a straw — and a “back up” bottle for use as needed before the next aid station arrives. That third cage is there just for a water bottle. It’s this water bottle that you’ll pull out at the base of each climb or “slow section” and quickly douse each arm sleeve, your crotch (hello, femoral artery!!!) and even your back. Four squirts and you are done and you are ready to begin climbing super smart and steady. While the water helps, and the cooling gear maximizes that water, nothing can replace the power of super smart riding all day. Make the most of every aid station. This exercise of soaking grows more important towards the end of the bike. Your mental target will be to use the final two bike aid stations as opportunities to get really, really wet to offset your growing heat accumulation. This continues through to the run, where you need to do the same at the first two aid stations. 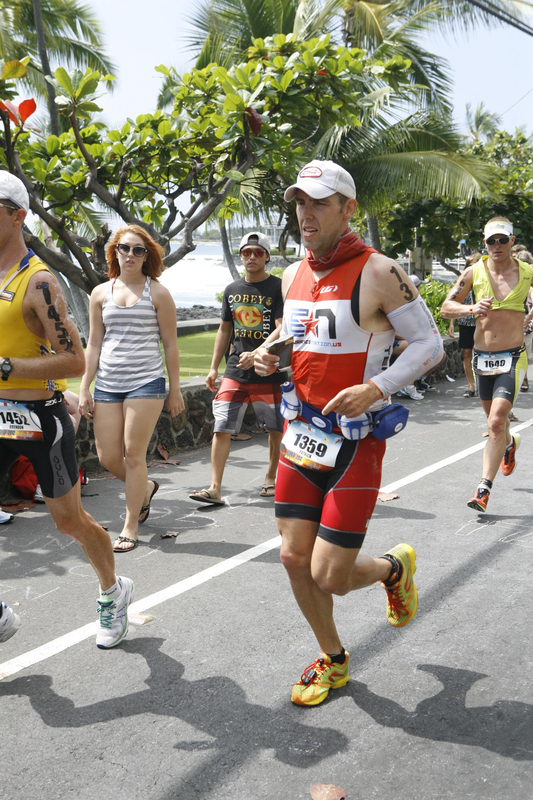 Remember that the first aid station in Hawaii is right inside transition — don’t miss it! But aid stations aren’t just about getting cool. Your “coolness” plan starts much, much earlier in the day. Let’s rewind to mile 10, where you have just survived the admin loop in town including the short climbs up Palani, Kuakini and back up Palani again. Everyone around you is riding at 400+ watts and the crowd support is insane. By the time you return to the Queen K you are already at Mile 7 on the day…and you’ll hit that first aid station in another three miles. But in your head you only “feel” as though you have ridden three miles to get there…so many skip this first aid station and you simply CAN’T do that! Every aid station counts; even the early ones. By the time you hit this first aid station you should be well into bottle #1 as you recover from the one-loop, non-wetsuit swim and T1, arguably the highest your heart rate will be all day. If you aren’t on your hydration game here, things will only get harder as the race unfolds with large, dynamic groups swarming the roads early on…and gusting winds and climbs later in the outbound loop. A smart early start affirms your intentions all day and sets your commitment to being the smartest version of you that’s possible. There’s nothing new here that you can’t do. No extra last minute work out. No new piece of equipment or strategy you haven’t tried before. 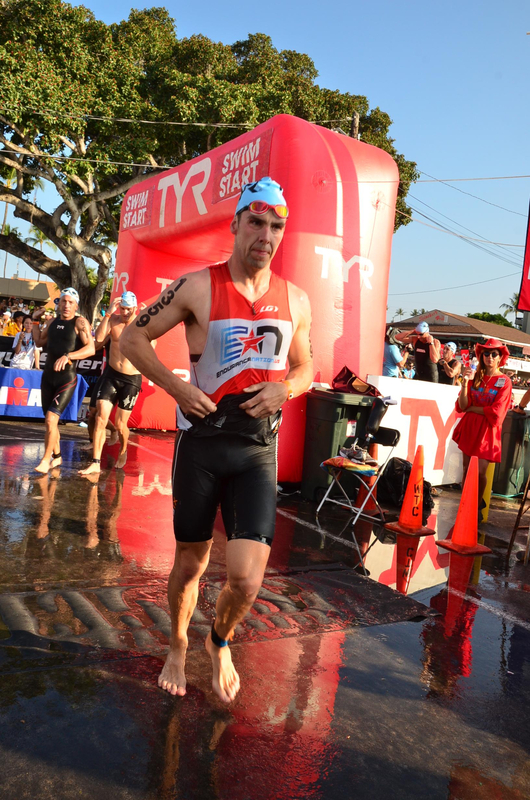 Ironman® Hawaii demands excellence of every competitor, and nowhere is that bar any higher than when it comes to managing the heat accumulation. So do your homework, make your plans, and promise me that you’ll stick to it on race day. In fact, why don’t you let me know out there on the Queen K when we are headed into the Energy Lab at Mile 17. A simply thumbs up or down will do the trick! Regarding heat acclimation #2, check out Spruzzamist.com which allows you to spray a mist over your face, neck, or chest while riding which keeps skin temps 15-25 deg cooler. Sounds like the perfect product for what you’re suggesting.